Basically, detox means cleaning the blood. It is a process or period of time in which one abstains from or rids the body of toxic or unhealthy substances; detoxification. I noticed I gained weight a lot, so recently I am trying out detox diet and it is somehow effective for me. Today, I partnered with Botanica Science and Moms Affiliate to bring you an amazing giveaway! You and a friend can try our organic 28 day supply of detox tea filled with 14 amazing fruits, herbs, and tea. Skinnytox consists of a morning energy tea you drink before breakfast, followed by an evening herbal detox tea you drink before bedtime. It's a great way to lose water weight, reduce bloating, detox your colon, naturally boost your energy, and support your metabolism. Plus, you can bring home the global canvas tote bag! It is a environmentally friendly, reusable canvas bag used to haul heavy or light loads in style. Whether you are headed to the beach, a weekend food market or another continent, the Botanica Science Global Tote was made to withstand whatever you can throw at it. The simple, modern design includes the countries from around the world where we source our tea ingredients. "NO PURCHASE NECESSARY" 18+ US, Canada and UK only! Contest starts 05/22/2015 and Ends 07/31/2015 11.59pm EASTERN. Entry options: Custom Entry Option, Visiting Fan Page. 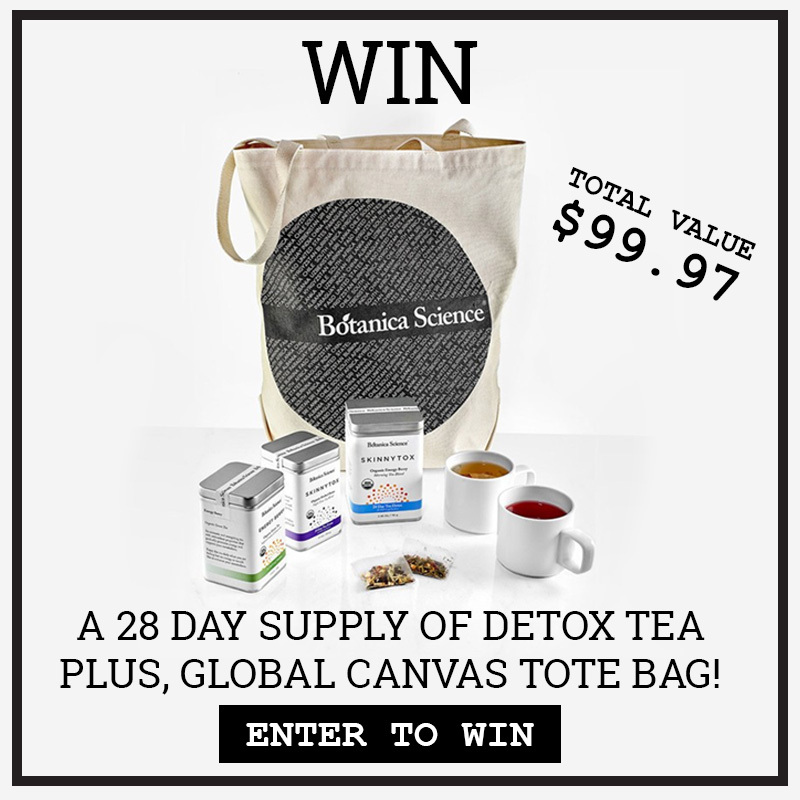 Prize: Botanica Science Tea. "The number of eligible entries received determines the odds of winning." Winners have 7 days to claim their prize. If potential Prize winner forfeits or does not claim the prize, prize will be re-awarded, at the advertisers sole discretion. All prizes will be awarded. botanicascience.com is responsible for prize disbursement and not Moms Affiliate or this hosting blog.